Internet today provides a broad range of products and services. From logistics point of view the most important difference between “brick ­and­ mortar” shopping, i.e. traditional retail store, is the need to deliver goods. Customers have traditionally taken care of the home delivery of products themselves. In electronic commerce (also e-commerce, eCommerce, Internet shopping, online shopping or e­business) goods are delivered directly from warehouse to customers. Centralization of storage reduces both the number of stock keeping units, as well as, the amount of total inventory. In theory, customers can be served globally using a single centralized warehouse. This on the condition that an adequate level of service can be provided with fast transports and with reasonable costs. The current warehouses are typically planned for wholesale operations and are consequently, not well suited to online logistics, and the growth of e­commerce is changing the traditional multi­level storage structure to more centralized systems. The level of stocks is also reduced with modular product structure. This means that consumer products are assembled from components and modules to fulfill customer orders. For example, computers are assembled from modules providing a wide variety of different versions. Similarly, the appearance of the product can be varied by means of coloured components. This may have a significant impact on the number of items in inventory (Stock Keeping Unit or SKU). Another important affect on e-commerce logistics, and particularly on transports, is the decreasing lot sizes, as goods are delivered to individual consumers. Thus, the lot size is reduced from tens or hundreds to individual products. The number of shipments will also increase due to the same reasons. This can been seen in the increase of international carriers. When consumers order books directly from, e.g. USA, they are delivered as individual packets instead of larger batches, which book wholesalers would order. Mail or postal services have traditionally taken care of a large part of home deliveries. When consumers purchase products from various internet stores, it increases the number of home deliveries. This is called the “last mile challenge”, i.e. how products are delivered from supplier to consumers. Pick­up points are traditionally offered by post offices, but today can also be found at gas stations, kiosks and at stores, which have the advantage of long opening hours. Consumers want pick-up points close to their homes, and also at commuting points. Consequently, pick­up points are found in cities at railway and metro stations and at other transport hubs. Automated pick-up points offer facilities to pick-up and also send packets around the clock, and accordingly, the amount and the use of automated pick-up points has grown rapidly in recent years. Low costs are also driving their amounts. Courier companies offer premium services for fast and flexible transport services. Experiments have also been carried out by providing homes with delivery boxes situated e.g. in garages. This enables distribution without the recipient’s presence and facilitates better scheduling of distribution. Otherwise, with home deliveries the problem is that all households want their products at the same time (“between 17­19”). Online shopping includes also sold non­physical products and services, such as tickets, games and entertainment content. The connected logistics does not require traditional storage or transport, as the goods can be delivered directly to the customer as e.g. electronic or mobile tickets. The sales of flight tickets have almost completely moved to internet due to lower costs. Food is one of the largest grocery sales items, and they are also the main reason why consumers go to shops and markets several times a week. During the Internet boom at the turn of the millenium, it was generally expected that also grocery sales would go online. However, this did not happen. In recent years however, grocery e­commerce has grown in several countries. Particularly, in the UK the grocery giant Tesco has expanded its sales by offering online shops with home deliveries and store pick­ups. Large volumes have enabled the automation of storage and pick-up, too. Online shopping brings along a higher pick-up and home delivery costs in grocery business. One of the challenge is that consumers are generally not willing to pay for the work done for them and typical delivery charges range from 7 euros upwards. Perhaps the most important reason for the slow growth of foodstuff e­commerce is consumers desire to choose products themselves. In particular, fruits and vegetables are among the goods, which consumers want to pick and choose. E-commerce has great potential in groceries, and its growth would have great impact on logistics and particularly home delivery services. Online stores deal directly with consumer and consequently supply chain is much shorter than traditional supply chain, consisting of producers, importers, wholesalers, distribution warehouses and stores. Doing business directly with supplier can cut down costs, but requires effective logistical solutions for success. These services are usually purchased from logistics service companies. From customer point of view, quality and timeliness are emphasized, as the challenge is to deliver a large number of products to customers within the promised times. This is particularly relevant in home deliveries with large number of customers. Online store don’t need themselves to carry out logistical operations as they can be outsourced to specialized logistic companies. These firms provide a wide range of services from individual transport and storage services to the complete package solutions. Online stores can therefore outsource logistics completely to the logistics company handling the entire supply chain from international transport, storage and distribution to home deliveries. Returns are a significant logistical challenge in online shopping, as, for example, in clothing almost 20% of buyers have returned purchased products. 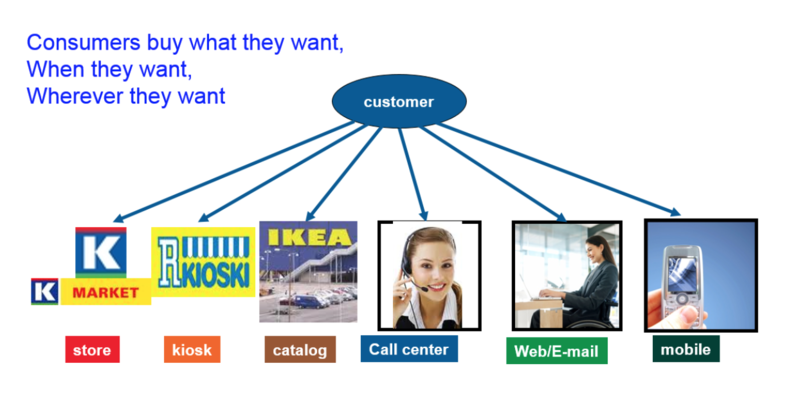 Multi­channel means the use of several different channels in the sales and delivery of products and services. In practice, this means that products can be purchased from the traditional store, online and through mobile devices. This development can be seen already in banking services, which can be used by visiting the branch office, ATM or by using a computer, tablet, or smart phone. 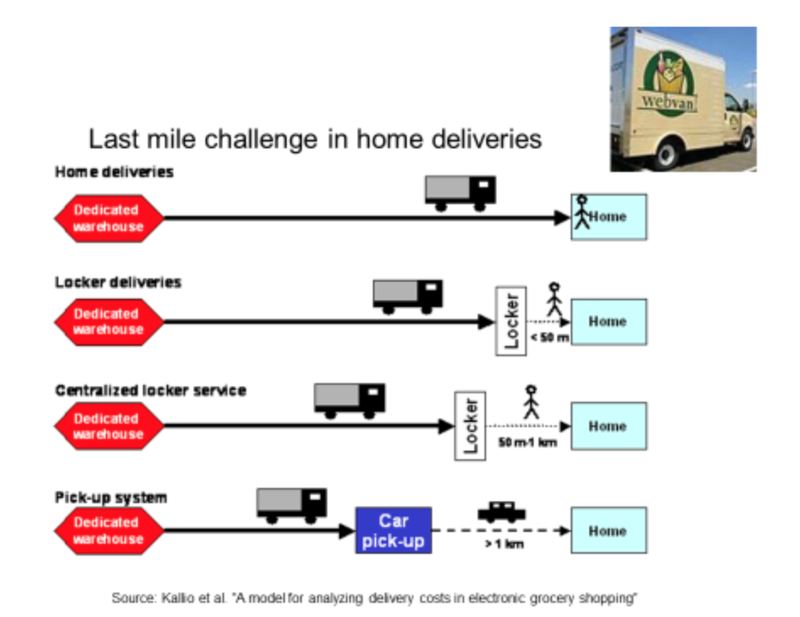 Using multiple channels changes logistics solutions, as goods are not delivered directly at stores, but have to be delivered otherwise to consumers’ homes. Multi­channel approach will also change the role of stores and shops. They are no longer the main place to buy goods, but assume the role of showrooms for consumers to look and try the goods. Logistics services will then deliver the goods to consumers. Currently, it is typical for consumers to search and compare goods online and then purchase from stores and shops. Traditionally a wide range and large number of products has been considered as the competitive strength of a store. From logistic point of view, this has always been a problem, as it leads to large stocks, and to threat of obsolescence of products. Consequently, volume products is the strong point of traditional stores. However, with centralized stocks, online store can provide very special products to wide markets with reasonable costs. These are called “long­tail” products where volumes are low, but customers can be served beyond a wide area. Figure 1 describes the differences between the mass of the products and long tail products. Pystyakselilla myyntivolyymi, vaaka-akselilla tuotteiden lukumäärä. According to statistics (Statistics Finland, other statistics) e-commerce has grown dramatically in recent years, with up to 10% annual growth, and this is expected to continue in the near future. Retail, or consumer sales have increased by 25% during the last three years. This has a clear impact on demand of logistics services. For example, hardware sales have grown by almost 90%, and sales of shoes by 60% over the past three years. However, we should remember the modest baseline volumes. Various online downloadable content has replaced CD’s and DVS’s in music, films and computer programs. In addition to domestic online shopping, up to one­third of purchase are directly bought by consumers from foreign online stores. United Kingdom, Germany, United States and, most recently, China have increased their share of online consumer sales. The main product categories are consumer electronics, which almost half of the buyers have bought in online stores. In addition, clothes, shoes and media products are being purchased by 20 ­ 25% of online shoppers. There are wide differences in the use of e-commerce among different consumer groups. While the younger generation (so called e­natives) is using e-commerce on a daily basis, the elderly ones use it less frequently. However, it is notable that there is a great potential in the older age groups (over 60’s) in online shopping as the majority of this group is using internet and mobile phones regularly. The non­users are found mostly in the age group of over 75’s. An older age groups have also the greatest need for home deliveries of goods, because for them the traditional supermarkets are difficult to use. Therefore, it is forecasted that the elderly will be an important user group of home deliveries. product search is also increasingly done by smart phones and tablets. In the age group 16­24 years, almost all (96%) have used Internet with a mobile phone. In Finland, almost 3 million consumers have shopped online, i.e. approximately 66% of the population. This is slightly less than in other Nordic countries (average 75%), so we can expect further growth. The average amount of annual purchase is almost 250 euros. Pick-up point is a pick­up location of the goods for consumers. Their advantages are mostly long opening hours, allowing easy access and convenience to consumers. Pick-up points are available, e.g. at supermarkets, shopping malls, gas stations and alike. Typically they are connected to long evening and weekend opening hours and good parking facilities. In the cities, pick­up points are also found at public transportation hubs such as metro and train stations.